DinoPaint Dinosaur Coloring Book is a fun dinosaur coloring book that helps kids learn all about dinosaurs and other prehistoric creatures. With 30 dinosaurs and other animals (in the registered version), this is a fun and educational way to occupy your kids. Each dinosaur coloring page comes with a Dinosaur Fact File, where you can learn all about the dinosaur - when it lived, what it ate, how big it was, and much more! DinoPaint is a fun dinosaur coloring book that helps kids learn about dinosaurs. ...... to use. Any child who is comfortable with the basic move and click features of the mouse will have no trouble with this fun product. The Fact Files give interesting and informative facts about all the dinosaurs and other prehistoric animals, including how big they were, when they lived, what they ate, and much more. There are 5 blank pages at the end of the book where kids (and parents too) can have fun with the marker pen, and eraser to draw their very own dinosaur pictures. Quickly fill in areas with the easy to use paint bucket. Click on the paint colorand then click on the part of the picture to fill. Explore the fascinating world of dinosaurs in a visually beautiful environment. Qweas is providing links to DinoPaint Dinosaur Coloring Book 3.1 as a courtesy, and makes no representations regarding DinoPaint Dinosaur Coloring Book or any other applications or any information related thereto. 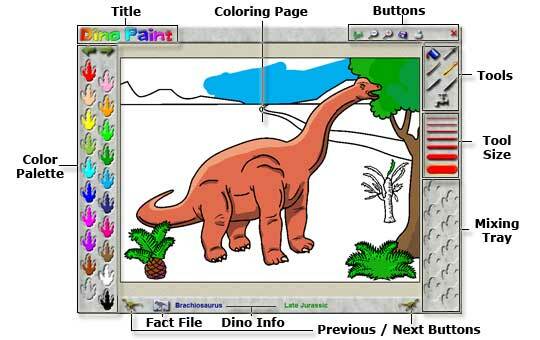 Any questions, complaints or claims regarding this application DinoPaint Dinosaur Coloring Book 3.1 must be directed to the appropriate software vendor. You may click the publisher link of DinoPaint Dinosaur Coloring Book on the top of this page to get more details about the vendor.